Mara Branković was the daughter of Serbian monarch Đurađ (George) Branković and Irene Kantakouzene. She entered the harem of Sultan Murad II of the Ottoman Empire. Mara was betrothed to Murad II in June 1431. The betrothal was an attempt to prevent an invasion of Serbia from the Ottoman Empire, though periodic Ottoman raids continued. On 4 September 1435, the marriage took place at Edirne. Her dowry included the districts of Dubočica and Toplica. According to the chronicle of George Sphrantzes, Mara was going back to her parents when Murad II died, dating her return to 1451. Sphrantzes records that the widow rejected a marriage proposal by Roman Emperor Constantine XI Palaiologos. Sphrantzes records that when her parents died (in 1456–1457), Mara joined the court of her stepson Mehmed II. When Mehmed became sultan, she often provided him with advice. Sultan Mehmed II had a great love for his stepmother Mara, who was an Orthodox Christian. It is believed by some scholars that had Mara taken up the marriage proposal of Emperor Constantine XI Palaiologos, Mehmed would not have invaded Constantinople. Constantine XI married twice. The first time was on 1 July 1428 to Theodora Tocco, niece of Carlo I Tocco of Epirus. She died while giving birth to a stillborn daughter in November 1429. His second marriage was on 27 July 1441 to Caterina Gattilusio, daughter of Dorino of Lesbos, who died in August 1442 after suffering a miscarriage. He had no children by either marriage. 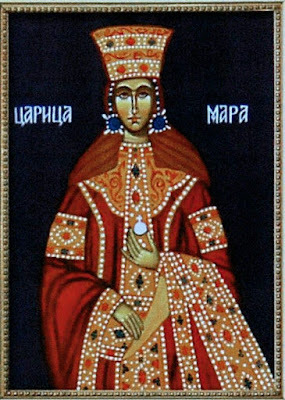 After his coronation in 1449, Constantine XI sent a commission under George Sphrantzes asking Mara Branković, daughter of the Serbian Despot Đurađ Branković and Roman princess Irene Kantakouzene, to marry him. By then Mara was the widow of Murad II; she had been allowed to return to her parents in Serbia after the death of Murad. The proposal was welcomed by her father Đurađ Branković, but it foundered on the objection of Mara herself who had vowed that "if God ever released her from the hands of the infidel she would lead a life of celibacy and chastity for the rest of her days." She also believed that being almost forty years old, it was not proper as a Christian to enter into a new marriage and it would be best to enter a monastery and dedicate her life to prayer. Accordingly, the courtship failed and Sphrantzes took steps to arrange for a marriage with a princess either from the Empire of Trebizond or the Kingdom of Georgia. The choice eventually fell to an unnamed Georgian princess, daughter of George VIII. He started official negotiations with the Georgian king, who had sent an ambassador to Constantinople for that reason. It was agreed that the next spring, Sphrantzes would sail for Georgia to bring the bride to Constantinople, but Constantine's plans were overtaken by the events of 1453. Constantine XI was never to marry again, nor have any children. According to the Turkish historian Murat Bardakçi, if Mara had married Constantine, there is no way Mehmed II would have gone against his beloved stepmother and taken Constantinople for himself. Mara had taught Mehmed as a young child the basic tenets of the Orthodox faith, and it is believed according to Turkish tradition she even taught him to say the Lord's Prayer, which he often prayed, but when Murad heard him, he disciplined him with his own hands. Yet until her death in 1487, Mehmed II loved Mara as a mother, and would never have went to war against her. Most likely the Ottomans and the Romans would have co-existed and helped each other flourish, at least for a time. On May 29, 1453 Constantinople fell to the Ottomans. The body of Constantine XI was never found. Mehmed entered the City victoriously. Mara continued to persuade Mehmed II to respect his Orthodox Christian subjects and allow them to live in as much peace as possible. For she also hoped that one day Constantinople would return to the Romans.